The trick in designing the costumes and the whole 'world' of Gormenghast was to draw together dozens of elements and inspirations into a look which can be recognised as itself and nowhere else... This task fell to costume designer Odile Dicks-Mireaux, an experienced designer for film and television who nevertheless, was new to creating a world of costume, rather than re-creating one as she has done frequently for period drama. I tried to find a logic in my head of how to evolve the design. It's a very personal logic. I designed my own way of approaching it: the royals of Gormenghast would have had a ceremonial costume that would have been inherited through the ages. People sometimes get out old costumes and relics from dusty cupboards and wear them to celebrations or in religious ceremonies. I started with that premise. It had to be quite grand. 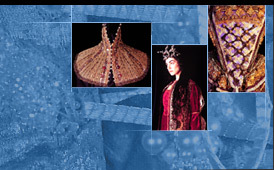 The costumes would be crucial in defining the feel of Gormenghast -- a place that is recognisable while not being identifiable with any particular place or time -- somewhere else, but full of people with real human thoughts and feelings. Among the alternative titles which Mervyn Peake had for the Trilogy was 'Passions and Shadows.' 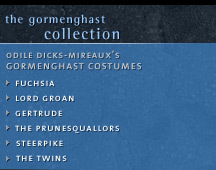 We needed to bring the clothes out of the shadows for the passions to have full play on the canvas of Gormenghast, and Odile Dicks-Mireaux was the person to do it... As the costume designer of Gormenghast, she had to invent reality -- make a world with its own dress-code. Odile searched through dozens of reference books, borrowing fabric from one century and design and shape from another, to clothe the people who would live in Gormenghast. Nothing is invented; it is all real. Every part of every costume has been done somewhere before, but never brought together quite like this. She made an imaginary world, but it was rooted in the real one, with borrowed conventions put together into a coherent whole with its own internal logic. You could read this world in different ways. But I think that what we did was appropriate. I gathered Estelle's ideas and Andy's ideas and Christopher's ideas... we all worked as part of the team and we evolved a style. I wanted to create a feeling -- and the group was very much in agreement -- that everything was as old as we could possibly make it, an ancient world, revived. My process is to do a lot of research in books and then try to work out which way to go. In the early stages we were quite tempted by a late 19th-century Sarah Bernhardt kind of look, with lots of textures and fabrics and the sort of pre-Raphaelite feeling of very loose clothing based on the medieval. And then I wanted more of a shape, and I wanted it to feel sort of Victorian in a strange way, because it felt as though Peake was writing about the colonial empire of Britain coming to an end. I was thinking about the Edwardian period when it was at its height, you know, the exotic clothing from that period. And I was thinking about a late Victorian shape. We evolved a corset through practicality that had that feeling, but it was more 16th century. And the making of the costumes then evolved from there. We created every fabric that you see, rather than buying it or finding it. We actually started with a piece of velvet and then broke it down and added things to it and printed on it and built up a texture. It started to take off in its own way. I used some of Peake's original sketches to guide the silhouettes. I went to the British Library and photocopied all of Mervyn Peake's illustrations into a little book. I had very good references for Barquentine, the Queen, Steerpike, Fuchsia, and Prunesquallor -- and even the king with his crown. We had to create a style for the men that would look not too ancient... that wouldn't look too period, but would somehow fit in this world. Peake describes the professors in a very specific way with their coats and their suits and all. Their coats were cut as in the Charles I period, but we made them longer so they looked more Victorian, and then we gave them Mandarin collars -- a Chinese influence. A book about the Hungarian court was very inspirational because it was a cross between East and West. They had these kind of Russian Mandarin sort of frock coats. It all seemed to gel. You felt you could believe these clothes. After Lord Groan's death, young Titus borrows some of his clothes, and not only because of their ritual significance. This device seemed to suit Gormenghast, with the authenticity of the aristocracy who will mend and make do, rather than buy new. Two key castle servants, Flay and Barquentine, need to look as if they have not changed for hundreds of years. Barquentine's rags are made of velvet designed to look as if it has been worn since the Renaissance, and Flay's long dark clothes make him thin and ageless. The length of Flay's coat, and his curious half-sleeves are inspired by those Hungarian court pictures. He is the senior servant, and looks distinctive, but the same look is repeated in part for the livery of other castle servants, who were then topped off with purple wigs, putting them firmly in the fantasy world of Gormenghast. The detail too is a pleasure to do. You might not see the detail but you do see the texture. If it weren't there you'd notice it. You get this whole feeling of richness, and each detail gives more richness to it. And those who are really interested do appreciate it. Today, the costumes are stored in Rotherhithe (in a warehouse on the Thames) where they were made. They've been on a couple of expeditions, but they're sitting there now, and one day they'll probably get made into something else!